If you aren’t at least peripherally aware of the FTK, there’s a good chance you’ll very soon get to know and hear about them in Ghana. The group, founded and operated by two Nigerian twin brothers, Falobi Taiwo and Kehinde, is already making waves with their style of music and performance in Nigeria. If there's one word to aptly describe FTK’s artistic ingenuity and personal growth, it's certainly, hard work, as their passion for music led them to record their first single in the same year (2014) as they started out. Falobi Taiwo and Kehinde (FTK) are both undergraduates of Babcock University, Nigeria where they are currently studying Mass Communication with bias for Advertising and Journalism respectively. They ventured into the world of music and have so far released four audio singles and two videos. ‘’Our strength lies in our ability to play some instruments, understanding of music having gone through a music school, energetic but choreographed dance steps backed up with professional dancers as well as proven ability to perform with live bands," they stated. 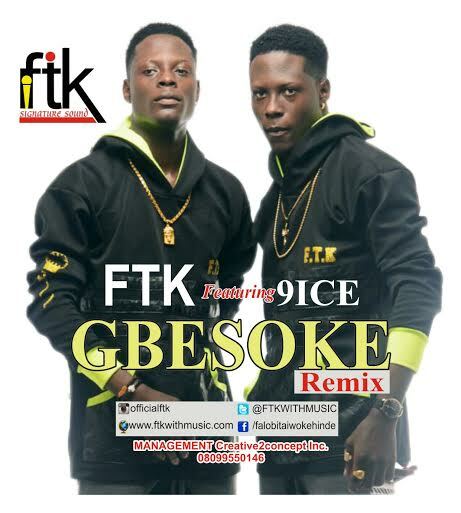 FTK has just released "GBESOKE remix" in Ghana, featuring the popular Nigerian Act “91ce". It is a fast tempo celebration of their act which is directed at both the youths and the old alike. They have previously released 5 singles with 2 videos in Nigeria while two (2) singles are also ready but yet to be released.